REFERENCE for “ GASTEH BG” Ltd. 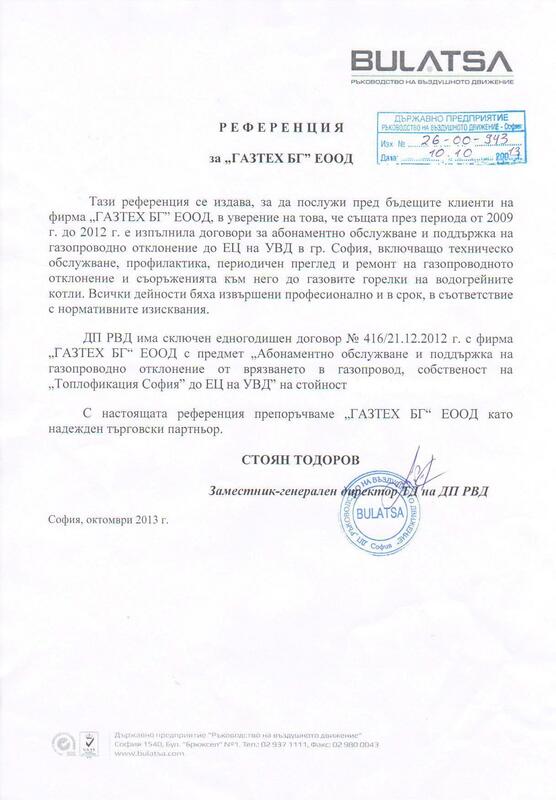 This reference is issued to serve to customers of the firm “GASTEH BG” Ltd., to certify that the same during the period from 2009 to 2012 fulfilled contracts for subscription service and maintenance of the gas deviation up to the EC to UVD in Sofia, including servicing, preventive maintenance, periodic inspection and repair of gas pipelines and its facilities to the gas burners of hot water boilers. All activities were done professionally and on time in accordance with the regulations.